The architecture of future homes will evolve on an entirely different basis from today’s houses. The structural elements­ would be flexible and coherently­ arranged to best serve individual preferences. Houses would be prefabricated using a new type of pre-stressed, reinforced concrete with a flexible ceramic external coating that would be relatively maintenance free, fireproof, and impervious to bad weather. The construction of their thin shells can be mass-produced in a matter of hours. Furthermore, with this type of construction, there would be minimal damage to homes from natural disasters. The interior of smart homes would have no source of light in the form of lamps and hanging fixtures. Instead, all the walls would evenly illuminate — either­ the entire inner surface or particular areas. One would also be able to specify the colour and intensity of the illumination. Thermopanes would be used to tint out bright sunlight by variable patterns of shading. All these features could be selected by the occupants to supply more than enough of the energy required to operate the entire household. The buildings would be designed as self-contained residences with their own thermal generators and heat concentrators. Photovoltaic arrays would be built into the skin of the building and into the windows themselves. A considerable amount of water can be saved by designing bathroom installations into one system. A shower, sink and toilet moulded into one system would be the simplest type of bathroom that would only use one sixtieth the amount of the water used in today’s more common bathrooms. Waste water from the shower and sink would automatically fill the toilet; so instead of telling people to save water, there would be a system built in. Cleanliness and hygiene will become major features of future homes. By building in several sensory devices, homes would be able to detect fire, toxic materials — anything that may threaten the life of a human being. With these nervous systems built in, future homes would be smart homes. When you leave the building the entire building is clean. With a slight increase in air pressure in the building, no dust would be able to come in from outside. If there are any contaminants in the air it would increase the electrostatic charge, which removes contaminants. For apartment buildings and other large structures, Fresco has devised a cybernated construction system. The idea is that computer-controlled robots would handle 90% of the movement and placement of prefabricated components. Special advanced materials are to be developed, eliminating waste and minimising the need for manual labour. Guided by satellite, and using a sophisticated form of artificial intelligence, the buildings will actually construct themselves — a technique Fresco has named “self-erecting structures”. One of the most interesting aspects of tomorrow’s civilisation is that people’s homes will change as the people living within them change. As people’s needs and dimensions of knowledge grow, so will the environment in which they live. IMAGINE living in a house that is permanently dust free, driving a car that automatically repairs itself, traveling at two thousand miles an hour in absolute comfort, and having the chances of getting ill significantly reduced by living in a city that self regulates it’s air and water by design. These idealistic-sounding goals are more possible than you might imagine. Future by Design is quite honestly the most inspiring documentary I have ever seen that illustrates just how possible and practical such things are. There is, however, a bittersweet quality to the film: on the one hand it shows how technologically advanced and capable we are – illustrating how the world could be today rather than tomorrow or in the future. On the other hand, it describes how behind we are politically and how future progress is painfully halted due to certain systems set in place. Thomas Edison had to actually make an electric light bulb before anyone took him seriously and backed him up. The same scenario can be said of Jacque Fresco – the man behind Future by Design. Fresco has been a social and industrial engineer and inventor all his life. Now in his 90s, he still invents and implements his ideas for a new, re-designed society – focusing his attention on The Venus Project – a small 25 acre ‘futuristic’ society located in Venus, Central Florida. Developed since the late 1970s, The Venus Project is a living model of how hi-tech and nature can co-exist. The small society consists of a scattering of dome shaped homes co-existing in a lush, natural environment. You cannot see one house when you’re in another and the entire project represents how sustainable communities could be created worldwide. And it isn’t necessary for one to have studied science or design in order to understand Fresco and his working concepts. I found my jaw on the floor as he presented designs (in all fields) that simply made so much practical sense. Even more appealing was the social philosophy behind each idea – that being to improve the standard of living for all people while simultaneously saving the planet. As an engineer, Fresco’s ideas are not part of his own view of how the world should be, but rather how the world could be today and what it takes to start progressing towards it. A dome-shaped home requires the least amount of material to build and offers the maximum protection against the elements due to its shape. By increasing the air pressure slightly inside the home, dust will not be able to enter it. Cleanliness will be a major factor in the future home environment. There is a type of memory alloy that reshapes itself when heated. Cars made from this material will straighten out any dents when heated (assuming that accidents will even happen in the future). Sensors installed in the front of vehicles can detect how far away other objects are and keep a constant distance between them. Travelling underwater is likely to become the future of sea travel as it is far more economical than travelling on the surface of the ocean where one is confronted by wind and waves. A long, thin boat that breaks the surface tension of the water by rapidly releasing air bubbles at the front while simultaneously drawing water towards the rear (propelling it forward) will be able to travel very economically at remarkable speeds. Having computers and machines continuously regulate the air and water supplies of cities and eliminating contaminants will significantly reduce viruses and disease. The real appeal of Future by Design is the idea of creating harmony between people and nature. The Earth is far more abundant that what we are made to believe and there are even ways of making the planet more abundant by improving nature and applying design technology intelligently. It is a sad reality that we live in an age where more time and technology is devoted to destroying humanity rather than advancing it; where global equality is greater than it has ever been; where more resources are invested in making a bigger, better bomb rather than providing clean drinking water where it’s needed. The standard of living proposed by Fresco and films such as Future by Design is by no means perfect; it is just significantly better. After all, the blunt truth is that no one knows what the future might bring, only that we can do a lot better with regards to the intelligent management of the Earth’s resources for the benefit of all the world’s people and protection of the environment. What can be accurately predicted is that the future of communication lies in 3D imaging, and I would therefore urge everyone to give Future by Design a watch. It should appeal to anyone who has an interest in technology, ecology, people, design and society, and the possible future of our civilization. MANY people maintain the belief that nothing is free in today’s world. While this may be true in the physical world, there is plenty of free stuff on the web (if you know where to look). This is particularly true with regard to creating and developing your very own website. Several web developers simply coin it by creating sites for individuals who don’t know any better. Granted there are several brilliant website designers who deserve to be paid well for their expertise. However, there are others who will charge a hand and a foot to create something that you could quite easily create yourself for free. Blogging is the most free form of beginning a journey in website design and development. One is able to choose a ready-made design from a large library of templates, publish posts to your heart’s content and make use of a variety of free-to-use tools. Taking things to the next level, however, is a different story and often involves having to spend something. There are several website builders that label themselves as “free” yet there is always a catch. Basically the beginning stages are free, but the hidden agenda becomes apparent once you become excited about website building and want to take things a little further. Nevertheless, I have come across two website-building sites that I would like to share with anyone interested in self-taught web design. After all, teaching oneself a new skill, whatever that may be, should always result in the warm and fuzzy feelings of self-satisfaction. 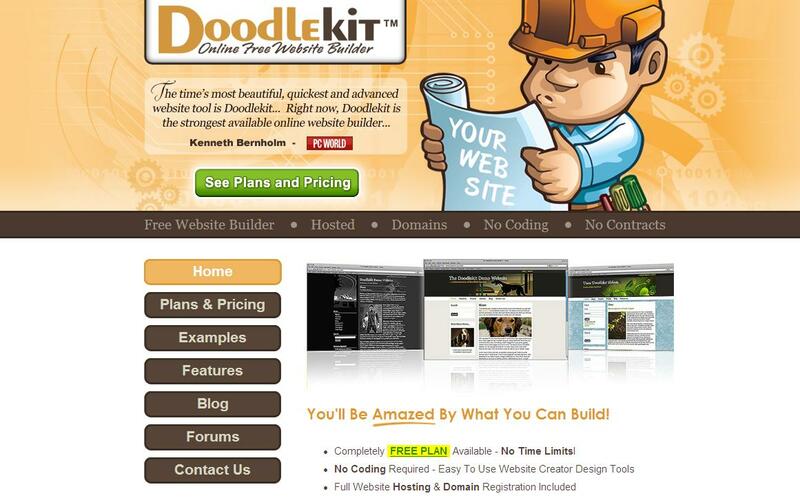 Doodlekit is a fully hosted free website builder and content management system that claims to be the quickest and most advanced website tool available. That is a mighty claim which is surely shared with several other website builders. However, I would agree that Doodlekit is at least easy to use. First-timers may not be able to design a website “within minutes” yet can at least doodle with designing for as long as they please without any charge. 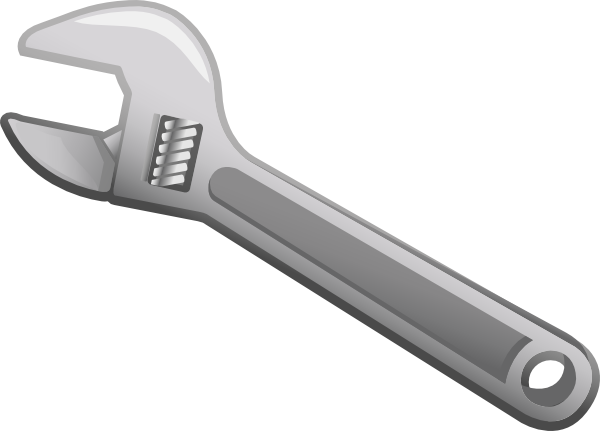 What’s also great is that the site doesn’t require the installation of any software – all aspects of it are done online via the Doodlekit website. 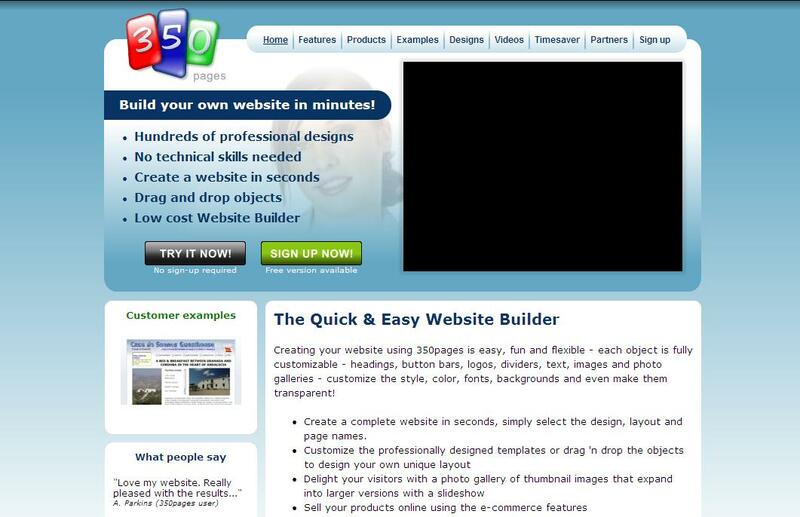 350 pages markets itself as the “quick and easy website builder” that is “fun and flexible”. They’re also convinced that us ‘ordinary’ folk can produce a professional-looking website in minutes, if not “seconds!”. The site does have some great features though, despite being a little over-appealing (a typical tactic used to rope one in). It is a bit more professional than Doodlekit in the sense that it allows one to fully customise each heading, button bar, logo, divider, image and photo gallery, and even goes as far as allowing the customisation of fonts, styles and colours. Such stylistic changes are often deep in the realm of professional web design. What’s also great about both these design tools/websites above is they don’t require you to do any coding whatsoever. Specifically with 350 pages, layout is as simple as dragging and dropping content using your mouse. It may be a sad reality for web developers who slogged away for years learning HTML, but a warm welcome to those who don’t know an “<a href>” from an “<align-left>” code. A particularly pleasant feature of 350 pages is that it offers a library of video tutorials to get you started. The only catch (as the title suggests) is that you can only design up to 350 pages for free before having to pay anything. Yet this isn’t really a catch, because if you get as far as 350 pages you should have built up enough confidence and web design skills to take things into your own hands. I wish you many hours of happy doodling. IT must be good to be Google. Bringing joy and information to millions around the world every day, while earning billions in the process must feel really fulfulling. Getting the opportunity to work for Google is the dream job of many Internet junkies. I’ve always imagined that the job of creating customised versions of the Google logo is one of the most coveted in the company. Imagine being asked what you do for a living and being able to repspond with, “oh I’m just doing a little graphic design work at the moment creating logos. Have you ever heard of Google?” You’d have Internet geeks polishing your shoes and bringing you freshly-squeezed orange juice. However, it seems that this is not the case. There is no single Google King-God who is the master behind every customised logo. That is why it is usually just the standard blue, red, yellow and green logo. But, every little now and then we are pleasantly greeted by a customised logo — creatively crafted to commemorate a significant event in history or to celebrate an important person’s birthday. I’ve been excited to see these appearing more often than usual, which is largely due to a new annual Doodle 4 Google competition, and 2009 has seen some of the best designs yet. It’s really worth doing the above for you may be missing out on these visually-pleasing bits of knowledge. When a customised logo appears hover your mouse over it to get a description of what it’s all about. If intrigued enough, click on the logo to be presented with a wealth of information on the event. So, without any further ado I present you with some of the top logos and best designs for 2009. Google displayed this logo on July 22, 2009 on Google China and Google India homepages to commemorate the longest solar eclipse in both countries for at least a century. The solar eclipse lasted as long as six minutes and 39 seconds in some places. This eclipse is also considered as one of the most watched eclipses of all time because of the path it takes, it is clearly visible from some of the most densely populated places on earth. 400 years ago (on August 25, 1609), the Italian astronomer and philosopher Galileo Galilei showed Venetian merchants his new creation — the telescope. The instrument was to bring him both scientific immortality and, more immediately, a whole lot of trouble. Galileo’s discoveries were, perhaps predictably, not best welcomed by the Catholic Church, and he spent the final decade of his life under house arrest. Google pays tribute to comics by displaying this logo (on July 23, 2009) with the launch of a new super Google logo by DC artists Jim Lee, Scott Williams and Alex Sinclair. The logo marked the start of Comic-Con festivities. On May 17, 2009, Google celebrated the birth anniversary of Igor Fyodorovich Stravinsky by displaying this logo on all its homepages. Igor Fyodorovich Stravinsky (June 17, 1882 to April 6, 1971) was a Russian composer, pianist, and conductor, who was considered by many to be one of the most important and influential composers of 20th century music. He was a quintessentially cosmopolitan Russian who was named by Time magazine as one of the 100 most influential people of the century. In addition to the recognition he received for his compositions, he also achieved fame as a pianist and conductor<!–, often at the premieres of his works. On July 10, 2009 the Google logo was transformed into a Tesla Coil to celebrate the birthday of Nikola Tesla. Tesla (July 10 1856 to January 7, 1943) was an inventor and a mechanical and electrical engineer. Tesla is often described as an important scientist and inventor of the modern age, a man who “shed light over the face of Earth”. He is best known for many revolutionary contributions in the field of electricity and magnetism in the late 19th and early 20th centuries. Tesla’s patents and theoretical work formed the basis of modern alternating current (AC) electric power systems, including the polyphase power distribution systems and the AC motor, with which he helped usher in the Second Industrial Revolution. Google celebrates the anniversary of first manned spacecraft (The Eagle – Apollo 11), which landed on the moon on July 20 in 1969. Google celebrates the birth anniversary of Mary Cassatt (May 22, 1844 to June 14, 1926). Mary Cassatt was an American painter and printmaker. She lived much of her adult life in France, where she befriended Edgar Degas and later exhibited among the Impressionists. Cassatt often created images of the social and private lives of women, with particular emphasis on the intimate bonds between mothers and children. The Perseids are a prolific meteor shower associated with the comet Swift-Tuttle. Meteor showers occur when the Earth moves through a meteor stream. The stream in this case is called the “Perseid cloud” and it stretches along the orbit of the Comet Swift-Tuttle. The cloud consists of particles ejected by the comet as it passes by the Sun. Most of the dust in the cloud today is approximately 1 000 years old. The shower is visible from mid-July each year with the greatest activity between August 8 and 14, peaking on August 12. During the peak, the rate of meteors reaches 60 or more per hour. They can be seen all across the sky, but because of the path of Swift-Tuttle’s orbit, Perseids are primarily visible in the northern hemisphere. AOL.com (the web portal of America Online), was a powerful player in the early days of the Internet, but has lost ground since then due to stiff competition. However, it is currently refashioning itself as a popular one-stop portal. The web portal rolled out a redesigned homepage yesterday which it hopes will become a central station of sorts for Internet travelers by letting people coordinate social networks, email accounts and more without switching from site to site. The move comes a month after AOL.com, the number four gateway to the web after Google, MSN and Yahoo, revamped its homepage to allow users to preview outside email accounts without having to navigate away from the homepage. The new RSS feed browser allows users to receive news from other websites and display it in scrollable window at the bottom of the page. Entering the name of a US city or zip code provides a feed of local news and weather. Another feature labeled “Themes” gives users the possibility of personalizing the homepage by choosing a color or backdrop of their own design. The functionality of the new site is allowing users to create their own personalised one-stop portals.